Each week we take a look at the good, the bad and the ugly of the home entertainment offerings, reviewing and rating the films and the special features packed onto the discs. Derek Cianfrance delivers another powerful drama with Ryan Gosling leading us through a tough depiction of the tumultuous relationships of fathers and sons. The discovery of a son he previously had no knowledge of sends Gosling’s tautly constructed lead through a series of robberies to win the trust of his son’s mother. The three act structure is beautifully handled with a simmering tension as thematic lines are set down which the fates of the characters are drawn into. The moral legacy of the film’s early sequences are explored with a precision which results in an emotionally powerful film. Perhaps the best work Cianfrance has delivered so far. Like Blue Valentine, there is a tight hold the director exerts over the strands of character development, and each passing moment draws you in deeper. It is a marvellous accomplishment and Gosling shines alongside a fine cast which includes Eva Mendes and Bradley Cooper. It is an essential film, destined for classic status with a murky labyrinth of motives and actions culminating in an unsettling mood which is very hard to shake. The commentary is where you’ll spend most of your time, as Cianfrance proves a gracious and thoughtful host. There are the usual deleted scenes and a basic featurette on the production but this again makes you yearn for more, and the days of The Hamster Factor and Full Tilt Boogie. There are good stories behind these films, and while these features are a nice addition some films, this included, could stand to be greatly illuminated by a more thorough set of extras. Harmony Korine’s self-styled fever dream is a hyper-real low down and dirty crime caper set against the blistering sunscapes of Florida in the hedonistic whirlwind of Spring Break. That it couples a pair of former ‘Disney’ starlets with James Franco’s gangster rapper (as opposed to a gangsta rapper) and shoots them through a violent, sadistic, drug-addled crime spree earned it a moment of notoriety, but there’s much more to this than wanton titillation. Franco’s character is by far the most seductive, the four actresses are an engaging set but never have the definition for the gut punches to smart. Korine’s direction gives us some fine moments (the first restaurant hold up, the countless beautiful fragments of the girls’ journey), and it rarely strays into self indulgence. The soundtrack was produced by Skrillex and features some great work by Cliff Martinez, and there’s a heady evocation of the dark underbelly to the hedonism which avoids the same hollow fate as The Bling Ring. Korine is always an interesting director to watch and Spring Breakers is a lot of fun with enough snap and personality and visual beauty to satisfy. The commentary from Korine is a joy. There’s the usual production details but the gold is in the descriptions of how he set out certain scenes. The final confrontation with Alien and Selena Gomez’s Faith was sprung on the actress moments before it was shot, Korine talks about pushing Franco to be more suggestive, more aggressive – it makes for pretty uncomfortable viewing. There’s a lot more like this so if you have the disc give it a whirl. It’s certainly better than the rest of the features which distil each of the usual components (Making of, character featurettes etc) into a couple of minutes each. With characters such as Franco and Korine this seems like a missed opportunity. Evil Dead is that rare beast – the remake that gets it right, utilising enough of the original’s plot and motifs to truly qualify as a remake rather than a lazy exercise in recycling. Wisely, there is no Ash character in this version, as Bruce Campbell’s iconic performance was best left as is. This time out, the five young adults at the cabin in the woods aren’t college students out for fun. Quite the opposite in fact, as the five have gathered at the family cabin of siblings Mia (Jane Levy) and David (Shiloh Fernandez) to help Mia kick her heroin addiction. A rank smell draws them to the basement of the cabin, where to their horror, they discover a room festooned with dead animals, as well as a book ominously wrapped in barbed wire which piques the curiosity of Eric (Lou Taylor Pucci). While The Evil Dead certainly didn’t skimp on gore, Evil Dead ups the ante about a hundredfold. But despite how gruesome it is, the gore doesn’t feel gratuitous or is never played for laughs, and feels grimly appropriate. 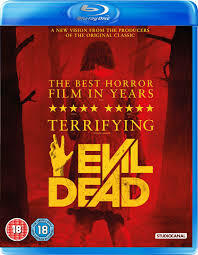 Evil Dead undoubtedly succeeds because of the involvement of the original creative team, who were clearly committed to crafting a new film that stands on its own merits and doesn’t tarnish the original. The extras are about what one would expect for a genre film. An entertaining and enlightening audio commentary with cast members Jane Levy, Lou Taylor Pucci and Jessica Lucas and director Fede Alvarez and writer Rodo Sayagues. A number of fairly standard featurettes, and the best of these is ‘Evil Dead: The Reboot’, which features Tapert, Campbell and director Alvarez discussing their motivations in re-launching the franchise. Curiously, Sam Raimi is completely absent from any of the featurettes. Perhaps he was busy with his Oz The Great and Powerful misfire. There are apparently no easter eggs on the disc, but watch until (or skip to) the end of the credits for a brief appearance from a familiar face. Last October Fox Home Entertainment released Will Smith’s 2004 sci-fi action film I, Robot in converted 3D and the results were surprisingly adequate. Depth in some shots aided the futuristic Chicago setting, whilst some action scenes had more breaking through the screen and engaging the audience. It wasn’t perfect, but for a Blu-ray debut it was decent. This year Fox have chosen Doug Liman’s failed franchise-starter Jumper, which sees Hayden Christensen learn he has the ability to travel in a flash to anywhere, as the big summer home entertainment 3D debut. As with I, Robot the film has been transformed (i.e. zoomed in, to fill the entire screen) so that the 3D will have a more enveloping experience, like James Cameron’s Titanic 3D. Where I, Robot had moments that made it worth watching the new transfer, Jumper’s dismal conversion leaves everything to be desired. A shot about 75 minutes into the brisk 88 minute film sees Jamie Bell’s Jumper flung into a pylon by Christensen, the camera follows, things fly about. Whilst the Blu-ray picture isn’t damaged to any major degree by being expanded, the lack of any conceivable depth, or any moment worth considering wearing glasses for, is a real death rattle for this release. In the end, Liman’s forgotten film is as disappointing in the third dimension as it ever has been, and no one will be talking about it come next week, just like back in 2008. Trouble in the middle-east is something that has been accepted by the majority of westerners who continually switch off at the trouble that’s too far away to be affecting. This documentary explores the heads of Shin-Bet, Israel’s equivalent to MI6, and their ongoing efforts to stop terrorism in Israel and Palestine. It’s the first time these people have been interviewed and covers years of the ongoing battle at the Gaza strip. It tells us a lot about both sides, both extremists and more importantly, how Shin-Bet failed to stop terrorism as well as become terrorists themselves. You see these heads of the massive division constantly pressured to stop terrorism at any cost. Innocent lives are the cost it seems. It’s violence against violence trying to stop violence. That will never correlate peace but it seems neither side can realise that. Taking a political side here will be dangerous because it will result in a backlash but it’s necessary to watch this documentary. 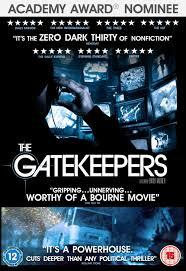 It has such an effect seeing videos of fatalities and casualties through actual footage or digital re-enactment. It’s upsetting to see such violence be a constant without any hint of resolution and to know that really we’re numbed to it, it’s tuned out of us, but this has a bit of power to really hit home the loss of the never ending war. 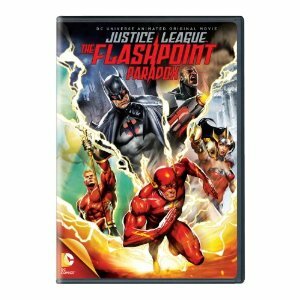 Sticking closely to Geoff Johns and Adam Kubert’s well-received Flashpoint (2011) comic, the Flash-centric story begins with an exciting prologue which sees the hero team up with the rest of the Justice League to take down his rogues. The following day, Flash wakes up in an unfamiliar world. He soon finds that he is powerless, the Justice League has never been formed, and Wonder Woman and Aquaman are about to start World War Three. To detail the other twists would be spoiling the experience for those who haven’t read the comic, but viewers will doubtless enjoy discovering what has stayed the same and what has changed. This is definitely one of the more intriguing ‘What If’ scenarios that DC has produced, and watching characters you know and love do things they wouldn’t normally do is just as appealing in animated form as it was in the comic. Director Jay Oliva has done a great job of not only discarding and minimizing some of the comic’s non-essential plot beats, but also expanding on the significant events. Much of that expansion comes in the form of the impressive action set pieces, which features some welcome cameos from the DC universe. Whilst some of the character models leave much to be desired, the action is just as fast-paced and strikingly choreographed as we’ve come to expect, and Flash’s powers in particular are superbly animated. This is still another strong entry in the DCAU that will satisfy fans of the speedster as well as newcomers. Should a live action Flash movie ever come to pass, this will serve as an excellent reference point. Lots here for DC fans. There’s a feature-length audio commentary from the filmmakers including director Jay Oliva, producer James Tucker, screenwriter Jim Krieg and writer of the original comic book Geoff Johns. ‘A Flash in Time’ featurette examining the science behind the fiction, and there’s an 8 minute sneak preview of the next DC Animated movie, Justice League: War. Also included are two bonus episodes from the vault, including ‘Requiem for a Speedster’ from Batman: Brave and the Bold and ‘Flash & Substance’ from Justice League Unlimited.